While years of bird surveys at FMR restoration sites point to yes, we're just beginning to gauge our impact on reptiles, amphibians, bees, butterflies and other pollinators. Luckily, we have many excellent partners — including students at local high schools and employees of companies we've long worked with — not to mention some fun wildlife cameras to keep watch when we're not around. For nearly a decade FMR has been surveying bird populations at several of our habitat restoration sites. We've seen especially dramatic results when we convert cropland or other low-diversity areas to native habitat, usually prairie. The number of bird species at these sites often more than doubles or even triples. At one small 22-acre restoration site*, only four very common bird species were recorded in its pre-restoration, cropland stage. In the six years since its restoration, we've recorded 20 species. As with many of these former cropland sites, several documented bird species are designated as Species of Greatest Conservation Need (SGCN). Of the six SGCN's at this particular 22-acre site, one is endangered in Minnesota (Henslow’s sparrow) and another is a species of special concern (Bell’s vireo). *Note: Since this example restoration is so small and the bird species so sensitive, we haven't publicly revealed its location. But we're happy to recommend several of our sites for excellent birdwatching, especially the Scientific and Natural Areas that FMR helped protect and restore, including Pine Bend Bluffs in Inver Grove Heights and the Sand Coulee in Hastings. To gauge how turtles, snakes, lizards and other reptiles and amphibians respond to our habitat restoration work, we added two monitoring sites in 2017. Both were in their initial before-restoration or baseline year. In a pre-restoration wetland area at William H. Houlton Conservation Area, local Elk River High School students working with FMR found only American toads and western chorus frogs. But our Cottage Grove restoration site owned by 3M fared even less well. Here, a series of "cover boards" meant to act as sunning and shelter spots for reptiles and amphibians, yielded evidence of just one creature (and a furry one at that): a white-footed mouse. As these wetland and prairie restorations progress, we look forward to reporting back. It seems we can only go up from here. In 2017, we also began monitoring for monarch butterflies at the Pine Bend Bluffs restoration site owned by Flint Hills Resources. We recruited and trained FHR employees to monitor potential monarch habitat weekly over the summer, following University of Minnesota Monarch Lab protocols. In the end, only a few caterpillars were found, but it was a powerful reminder of why such monitoring and research is important: While the decline of monarchs is now well known, we know very little about their habitat needs. Long-term, we hope the data contributed to the Monarch Lab will inform not only FMR's but many other conservation groups' efforts to save our iconic orange and black butterflies. Of course, many other native pollinators are also in decline. Throughout this growing season, FMR is working with Hastings High School students to track bee and butterfly populations in three restored prairie areas at Vermillion Linear Park. By doing so, we hope to get a snapshot of which pollinators use which plants or plantings, and how they support and affect these pollinator populations over time. In addition to monitoring pollinators, students from Open World Learning School are collecting insects from a prairie that we've been working together to restore at Indian Mounds Park in St. Paul. This will help us understand how changes in the make-up of this native blufftop prairie lead to changes in insect populations overall. In addition, St. Paul Academy students are monitoring for earthworms, an invasive species in Minnesota, at Crosby Farm Park in St. Paul. Here, we're looking at how the insect invaders impact native plant diversity so we can refine and prioritize our habitat restoration efforts at this and similar sites. 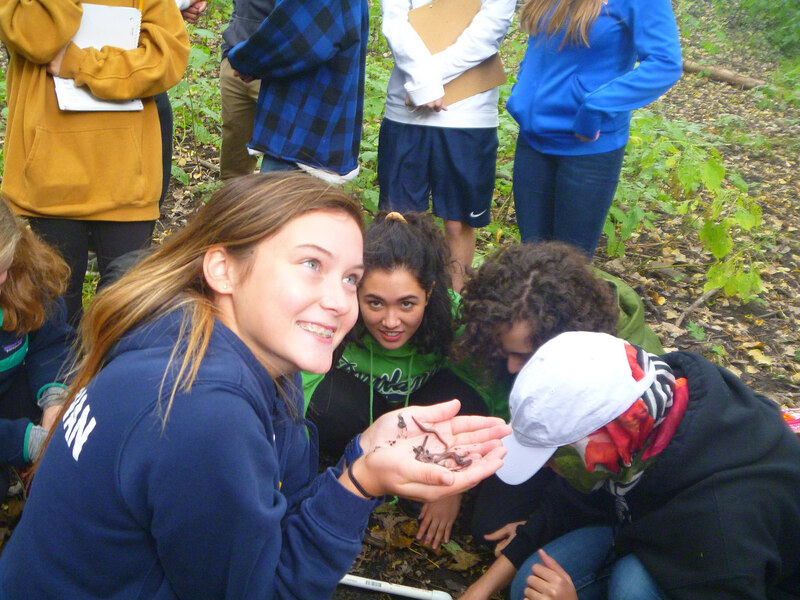 Students from St. Paul Academy survey for invasive earthworm populations at Crosby Farm Regional Park in St. Paul. Unfortunately, when it came to seeing whether a large snake hibernaculum at the Flint Hills site in Pine Bend was attracting its intended tenants, the cameras were a fail. Apparently, the snakes didn't move fast enough to trigger them! But we recently purchased a state-of-the-art time-lapse cam and hope to share some hibernaculum footage later this year. We plan to continue and expand our wildlife survey efforts in the coming years. While many things impact animal populations — climate change, habitat fragmentation and chemical drift among many other factors — suitable and available habitat remains a basic necessity. 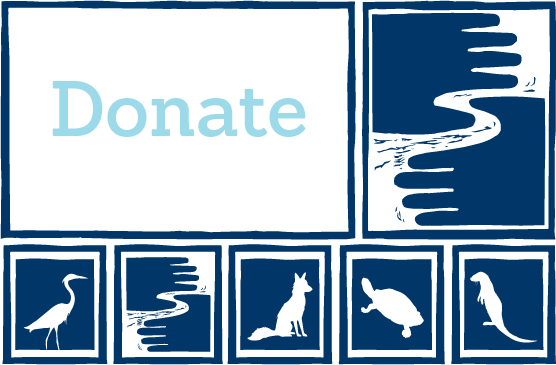 With the help of our local school and corporate partners, we hope to further quantify and illustrate the importance of its preservation and restoration for wildlife. Please see our ecological research and monitoring reports for the results of our most current wildlife surveys. Note: FMR Ecologist Alex Roth contributed to this article.